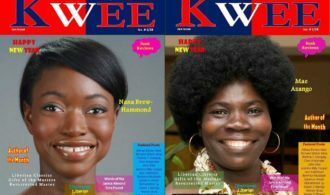 Nana Ekua Brew-Hammond and Mae Azango are the featured writers on the current edition of KWEE Liberia’s literary magazine. KWEE is a literary magazine based out of Liberian devoted to creativity, excellence and diversity. The term “KWEE” is a variant of “Kwi”, a Liberian concept that literally translates into ‘book’ as in ‘literate’ or ‘civilized’. The publication was set up in 2015 and is run by D. Othniel Forte the Managing Editor with the assistance of Vamba Sherif the Editor-Short Stories, Momoh S Dudu the Editor- Reviews and a host of segment hosts and contributors. The magazine has featured fiction, poetry and nonfiction from many contributors in the last few years. They have featured writers like Wayetu Moore, Josiah Joekai Jr., Jerome Cabeen, Lawrence Zarkpah, Lekpele M Nyamalon, Kiru Taye, Tolulope Popoola, and Ruby Yayra Goka. The current edition of KWEE is out and there you will find poetry, fiction and nonfiction from the regulars and new guys. These include a book review, poem of the month, and artist and authors of the month. The latter is our focus and those for this month are journalist Mae Azango and novelist and short story writer Nana Ekua Brew-Hammond. My approach to writing has been fluid. I used to write from an idea. I would get an idea or “hear” a piece of dialogue and use that as the thread to fabricate the story, not always sure what the final product would look like. Of late, I’ve started writing outlines that flesh out where the story is going and who the characters are. I find myself returning to stories about displacement and its impact on identity. I think it’s because of how I grew up, but it’s also what I’m drawn to: how we adapt in different settings or code switch among different groups of people. As the middle child of Ghanaian parents living in Queens, New York, I definitely tried on different characters and personas and I was hyperaware of how I was expected to behave as a black person, as a Ghanaian person, as a good little girl, and so forth—all expectations I picked up from cues transmitted via my family, friends, popular culture, books, magazines, the news, and at school. I think the writer in me was titillated by all these different narratives, though many hurt me and demanded I stow parts of myself away. You can read the whole interview from the current edition of the Kwee Magazine from page 27. I lived less than a second class citizen as (a) refugee and my life was living a nightmare, where torture and violations was my companion. I remembered on one instance when I mistakenly bumped into an Ivorian in a populated market, and he spat in my face and called me dog. I could not do anything because I was a refugee and did not have (a) voice. You can read the whole of the current KWEE magazine here and back issues here.